Ernio is produced by Xabi Urazzola who inherited his family’s apple orchard and farmhouse in 2005. Xabi (“Sha-bee”) knew the orchard could be a great site for wine production and decided to replace it with a vineyard to honor his father. Xabi began producing wine in 2009 and released his first commercial vintage in 2015. 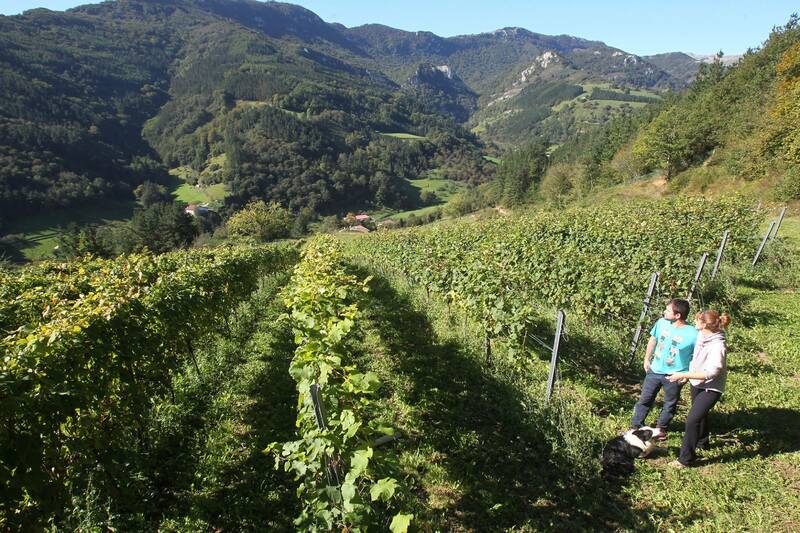 Urazzola is the only winery located in the lush, mountainous valley town of Alkiza. It is the smallest winery in the Getariako DO and the farthest inland. At 1,700 ft. it sits at a much higher elevation than those on the coast. The vines are 12 years old with southern exposure, protected by the mountainside from the hard winds to the north. Water is the biggest issue here. It’s wet. However, the locations of the vineyards relative to the angles of the slopes helps to channel water runoff away from the vines. The lower vineyard is trained with the classic Txakoli canopy, but upper vineyards have modern double guyot training. The Ernio mountain stretches up straight across the valley from the vineyard. In September the whole town ascends this special peak to be together. Some feel Ernio emits special magnetic forces with medicinal qualities and pass their legs, arms and any part of their body they can fit through large metal squares to channel this energy. The mountain has a symbolic emotional connection for everyone who lives around it.